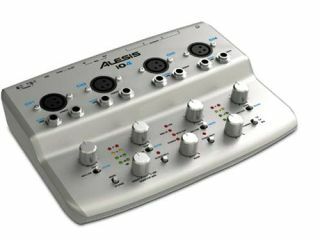 NAMM 2011 PRESS RELEASE: Alesis, a leading manufacturer of professional audio equipment and studio electronics, announces the iO4 USB audio interface. The iO4 is a compact audio-recording interface for home, project and portable studio recording setups. This four-channel USB device for Mac and PC-based systems enables users to record and monitor up to eight channels of audio (4 in, 4 out) at 16-bit recording, or four channels (2 in, 2 out) at 24-bit. The iO4 is compact enough to comfortably fit into a mobile recording rig, laptop bag or backpack, yet contains high-quality components and circuitry suitable for the studio. The iO4 has four input channels, each having an XLR microphone input, a 1/4" TRS insert for external effects units and a 1/4" TS jack that works with line-level sources and can accommodate direct connection of guitars. The iO4 features discrete-design preamplifiers and 48-volt phantom power on each of its four input channels as well for use with virtually all microphones and audio sources. High quality analogue-to-digital and digital-to-analogue converters ensure that every detail of each session or performance gets captured and played back faithfully. Producers and musicians will appreciate the ability to connect a second pair of reference monitors or route audio to external effects processors using iO4's four available output channels. For remote tracking and alternative playback, the iO4 has a 1/4" TRS headphone output. The iO4 features MIDI In and Out jacks for playing and controlling software with keyboard and pad controllers, workstations, and other MIDI-compatible instruments. The iO4 comes complete with a copy of Steinberg Cubase LE digtal audio workstation (DAW) software. Cubase is one of the most popular DAWs in the world, thanks to its intuitive approach to composing, recording, editing and mixing. In addition to the included software, the iO4 is compatible with virtually all audio and MIDI software. "You can set up and start recording anywhere with the iO4," said Adam Cohen, Director of Business Development, Alesis. "This compact interface is a quick, easy and extremely flexible way to record up to 4 channels audio into your DAW choice."